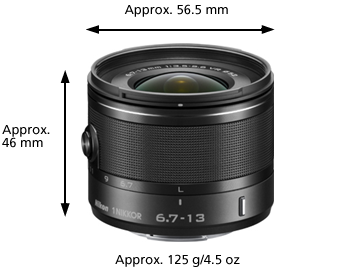 1 NIKKOR VR 6.7-13mm f/3.5-5.6 covers an extensive range of angles of view from an ultra-wide angle of 100° to a regular wide angle of 63°, which is equivalent to an approx. 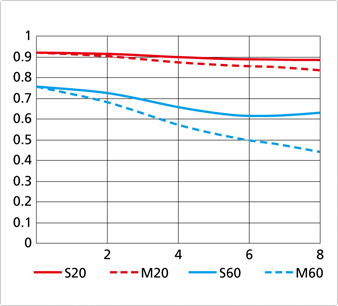 18 to 35 mm focal length in 35mm  format. With this broad angle of view, you can capture magnificent vistas and the ambience of a scene in your picture. This lens is ideal for creating an impressive image with an emphasized perspective. In addition to capturing a wider view of the scene, the ultra-wide angle can create a sense of depth and expansiveness by emphasizing the perspective between foreground and background subjects within the frame. Even when shooting in a limited space such as indoors and narrow corridors, 1 NIKKOR VR 6.7-13mm f/3.5-5.6's ultra-wide angle of view covers more people and surroundings. You can create a distinctive photo by capturing your subjects with more background and even the ambience of the site. With the wide angle of view, you can shoot a building, even if it towers over you, emphasizing the perspective. Wide-angle shots that impressively express the background depth can also be achieved even for subjects at a close distance. This lens delivers an unlimited variety of photographic expressions, as you can explore different compositions with diverse subjects utilizing its wide angle of view. Taking advantage of this lens' significantly short minimum focus distance, a dynamic close-up can be created. 1 NIKKOR VR 6.7-13mm f/3.5-5.6 comes in an amazingly compact body for such a high performance, ultra-wide-angle lens incorporating a Vibration Reduction (VR) function. Its lightweight body of approx. 125 g (4.5 oz) can be easily taken anywhere. 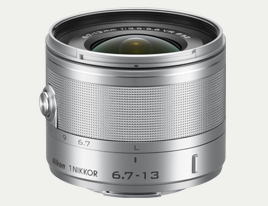 This lens consistently achieves a high-quality picture whether it is a closeup or a distant shot. With its high resolving power, finely realistic reproduction can be attained. 1 NIKKOR VR 6.7-13mm f/3.5-5.6 comes equipped with a VR function. 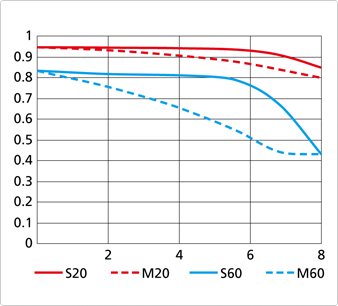 Under low-light conditions where slower shutter speeds must be used, slight camera shake is likely to cause image blur. This can be minimized by the VR function. 1 NIKKOR VR 6.7-13mm f/3.5-5.6 comes in a body that brings out the beauty of metal with its fine design details such as roulette, fine glossy line, and spinning (hairline) processing. The zoom ring with its metallic roulette, as well as its compact body, helps it fit well in your hands and delivers comfortable operability. You can smoothly operate the ring for flawless zooming. 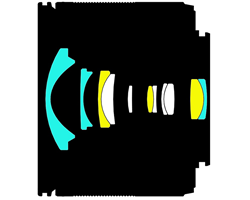 The lens barrel, which extends when zooming, is the same color as the lens body. *152mm Circular PolarizerⅡcannot be used with the supplied HB-N105 bayonet hood. Attempting to forcibly attach either of them while the other one is installed could damage the accessory. *2Lens hood names indicate type: HN for Screw-in, HR for Rubber Screw-in, HK for Slip-on, HS for Snap-on and HB for Bayonet.